Basement and crawl space mold is becoming a serious concern for homeowners more than ever before. Besides damaged personal property and a musty smell that can make its way upwards through the home, there have been many very serious mold-related issues in Colorado & New Mexico in recent years. With the sharply rising costs of mold remediation in recent years (which have almost doubled due to rising insurance costs), Silver River Basement Systems recommends preventing mold as the best, clearest solution. By sealing off the crawl space or basement and lowering the humidity level below 60%, it can help prevent serious damage to the home and to the health of its inhabitants. For a free dry basement or crawl space inspection and quote, call or e-mail Silver River Basement Systems today. 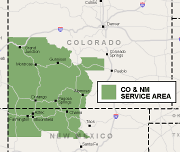 They currently serve Grand Junction, Farmington NM, Durango and nearby areas of Colorado & New Mexico. "If you are reacting to a problem because somebody's been sick, you've waited way too long to address indoor air quality"
If you experience stuffy noses, headaches, or any other allergic reaction in a building, and you find that your condition is relieved soon after leaving, it's possible that the symptoms have been caused or worsened by indoor air pollutants and allergens such as mold spores. Human Ecology Magazine has reported that dead mold and spores can still trigger allergic reactions, and microscopic mold spores that were not removed can lay dormant for years while they wait for the opportunity to grow. 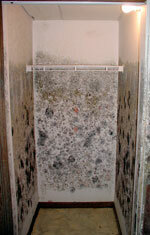 Mold spores can damage someone through skin contact, inhalation, and ingestion. Mold can lead to symptoms of allergic rhinitis, including a runny nose, watery eyes, a scratchy throat, fatigue, and mild allergic reactions. In extreme cases, mold is even toxic. To date, The American Lung Association reports that 88 million people in the United States suffer from some sort of respiratory distress, and 50% of homes have at least one person living inside that has allergies, asthma, or another respiratory ailment. Time Magazine reports hundreds of thousands of mold spores in a single cubic meter of air indoors; a single person inhales 10 or 12 cubic meters daily. 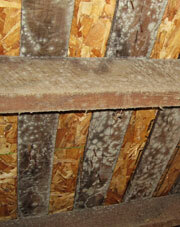 The Journal of Property Management warns that ignoring mold in the home can lead to extensive property damage. Repairs can be lengthy and in the most extreme situations can require the home's inhabitants to be relocated while the work is being done. Wherever there is moisture, mold can grow. This includes near plumbing leaks, leaking roofs, and especially in wet and damp crawl spaces and basements. If there are water issues within the home, it's extremely important to fix the problem and dry the area within 48 hours. Mold growth is common on drywall, cardboard, photos, memorabilia, wood, furniture, leather, cloth, fiberglass resins and paper backings, and anything else organic in the space. In a crawl space, structural damage is common as mold eats away at mold, and especially when termites, attracted to the rotting lumber, inhabit the space. Mold, mildew, and dust mites are a problem that homeowners, landlords, and building mangers are becoming increasingly concerned with in recent years. According to the Journal of Property Management, lawsuits have been filed by the tens of thousands against landlords, developers, and insurance companies in Ohio over mold-related issues. In response to this, many general liability and property insurance companies have begun to exclude mold from their protection policies. There are few regulations for acceptable levels set by the EPA for the results of mold testing. Ultimately, it's become a legal battleground, where homeowners and building managers have become the casualties. Trying to clean and remove mold in a crawl space with biocides or bleach is a temporary solution at best. While this can help to remove mold in the short term, this work can only be safely done by a trained professional. Bleach will not stop mold from growing in the long-term, and mold coatings can only protect what they coat, meaning that everything that enters the space will have to be treated from then on. Additionally, mold will still have a surface to grow on and spread its spores unless you can also coat your ventilation ducts inside and out. One of the primary methods recommended by the Environmental Protection Agency, is to reduce indoor humidity within the home to below 60%. They also recommend removing all sources of water leakage within the home, sealing penetrations in walls and floors especially in below-ground areas, checking for musty odors, and removing all sources of freestanding water. In order to lower the humidity level, you're going to need a strong basement dehumidifier, like the SaniDry™, available in Durango, Farmington NM, Grand Junction and the surrounding areas by Silver River Basement Systems. 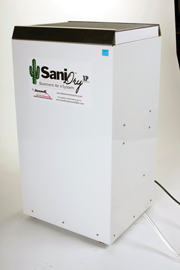 The SaniDry™ is a self-draining, ENERGY STAR® rated dehumidifier that's exactly what you need to eliminate mold in your basement. With a powerful blower, large cold coil, and an air filter that can remove particles as small as 2 microns, it can help prevent allergens such as mold spores, pet dander, pollen, and dust mite waste. If you have a finished basement, the SaniDry™ can easily be stored in a closet or unfished area and ducted into the space. Smaller SaniDry™ Sedona dehumidifiers are available just for the crawl space environment. For your Free Estimate and written quote on a basement or crawl space dehumidifier, phone or e-mail us today!